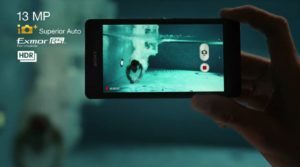 Sony just announced today its new upcoming waterproof smartphone today Xperia ZR with the capability of taking picture up to 5 feet under water for up to 30 minutes with a dedicated camera key. Xperia ZR is the Xperia Z series phone but in 4.6″ HD Reality Display bit smaller than Xperia Z the Flagship device, 720 x 1280p TFT capacitive touchscreen, equipped with shatter proof and scratch-resistant glass and Sony’s Mobile BRAVIA Engine 2 for sharp and bright viewing experience. The smartphone will be consisting 8 GB of internal memory and up to 32 GB additional by additional microSD. Sony has put a 13 Mega Pixel fast shooting camera inside Xperia ZR along with Exmor RS & HDR (High Dynamic Range), this is really a great quality camera to take picture or record video under water. Camera comes with autofocus and LED flash, featuring Geo-tagging, touch focus, face detection, image stabilization and sweep panarama. The camera can record 1080p HD video @ 30fps and there is a secondary front facing camera as well. Xperia ZR will be running on Qualcomm Snapdragon S4 Pro Quad-core 1.5 GHz Karit processor and Adreno 320 Graphics processor, boosting the performance with a massive 2GB RAM. This phone is coming with Android 4.1 (Jelly Bean), supports TV out via MHL A/V link. Xperia ZR has got Wi-Fi, Bluetooth, FM Radio, NFC built-in and coming in 4G LTE, and don’t forget about sharing with Android Beam. Sony has put a lot effort for making this phone, this is going to be a really nice smartphone in hand as the screen size is 4.6″ in-between Samsung Galaxy S2 and Galaxy Nexus but has got more battery life. Xperia ZR is a nice solution for under water photographers or snorkellers who like to take picture under water, It became easier to take picture of the sea life too. Sony is trying to establish their mobile business again with nice releases of phones after Samsung is the market leader for smartphones. This smartphone is expected to be in the global market by Q2 2013 that means this or next month. So, do you want to get a Xperia ZR – Waterproof Under 5 Feet to take picture and record video under water?